Forty million copies of the “Left Behind” series have been sold. The authors state freely their series is a “work of fiction.” Fiction is not a sin, nor even criminal. But, should fiction evolve into theology? The first rule of authorship: “Identify your audience.” This book is not for everyone. It is only for those who have ever wondered about the scriptural basis for the Rapture. 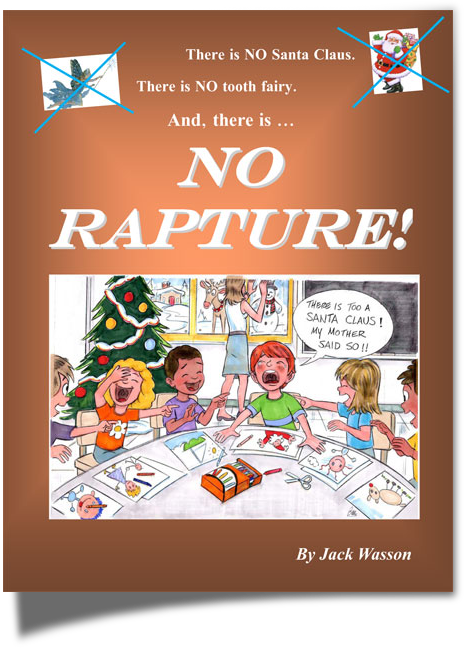 Originally published in March 2009, “No Rapture” is available through Amazon.com in Hardcover, Paperback and now in Kindle Edition. Over 1,000 scriptures cited in this book! “The book is incredible . . . A great and compelling read . . . presentation is extremely thorough and very well documented with Scripture. Hard to conceive where critics could find fault except it is such an entrenched teaching in the church. Good work man!” Gary Goodell, Pastor, Evangelist, former Four Square Bible College Professor and founder of 3rd Day Church Movement. “Examination of the Second Coming vs. the Rapture was a great help to differentiate them clearly. I like the way the book examines the Rapture as being DIFFERENT from the Second Coming. I did not SEE the question so I was missing the answer. Thank You. The Scriptural evidence you supply is concrete. I was thinking it didn’t matter what I believed about the Rapture or Second Coming because I didn’t want to get into the controversy. That was the old ‘ostrich in the sand’ thing you brought up. Now I realize it is critical to know. Missionary to the Palestinians in the West Bank. Written from Jericho. “I can’t do it! I can’t read it! It’s giving me a headache and causing my high blood pressure to spike!” Christian Editor and former Editor for Tim LaHaye after reading 32 pages in attempt to edit rough draft for the author prior to publication. “We couldn’t permit an ad in our Newspaper. We don’t employ a theologian. How could we tell whether or not it was false doctrine just by reading it? No one at our Newspaper is qualified to determine that.” Regional Christian Newspaper when contacted about an ad for the book.